We're back with part two of six of the Assassin Nation Plot, and what a way to end that last issue, right?! For those of you who don't know...wait...SPOILERS!! !...Aunt May has a serious heart condition and only six months to live! So we start with Spider-Man and Paladin out trying to get some answers again, doing the usual. Beating up bad guys, wrecking hideouts and for Spidey, hitting harder and liking it. He's letting his rage and concern for Aunt May get the best of him out on the field. He's sloppier, less focused, just worried about hitting things really super hard. Spider-Man causes just enough of a violent distraction that lets Paladin head into the building they're outside of so he can get some info. Inside, its all computer discs, something Paladin isn't too familiar with, so he takes everything! 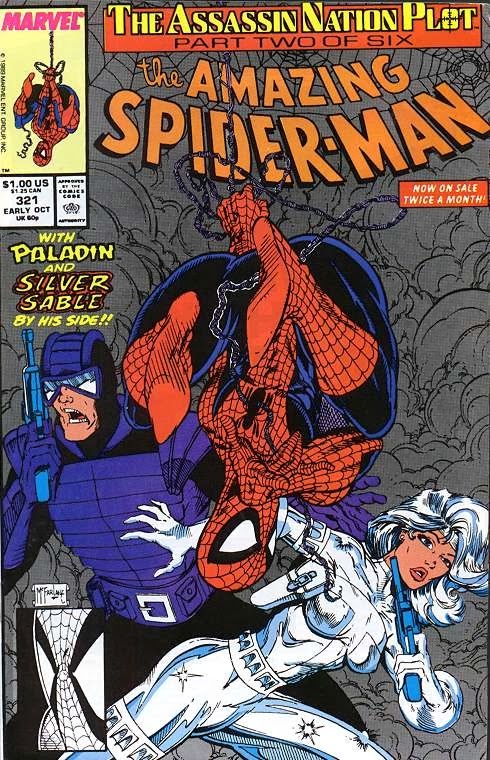 He and Spidey go their separate ways, leaving Paladin with info, and Peter pissed. Over at Aunt May's boarding home in Queens, Peter can't hold it in any longer. Against MJ's advice, he decides to tell Aunt May that he overheard her conversation the other day and knows about her heart condition. She's a little mixed by the news, she's glad that Peter cares for her, but she's a little upset that he was eavesdropping. Turns out she's not the one with the heart condition (YES!!!! THANK GOD!!!!!!) its actually Nathan Lubensky, the hardass from a couple issues ago that lives at the boarding home. May says she told his doctor to relay any messages about Nathan to her if he was unavailable. She's also thinking about phasing-out of her boarding operations, which would mean Pete and MJ need to find a place to live a little quicker than planned! The next day is the big moving day for Harry Osborn and Liz Allen. After hours of moving, Harry suggests to Pete and MJ they could take the loft upstairs from their new apartment. After checking the place out, after all you gotta make sure its Spidey proof, Pete finds a perfect sunroof in the bathroom. Guess they're gonna be moving in! Now that that's settled, Pete makes a quick call to the Sable, she tells him to meet her at a helipad so they can get to Jersey in some more suitable transportation, her plane. The plane is programmed to crash into a nearby river to cause another distraction. So when it does just that, the passengers hop out and make their move into the facility. Inside, Sable discovers an entire mall looking place under ground. And waiting for the group there are none other than Drake, Chakane and some new really big beefed up baddies. Drake has been building this mall for the same reasons he built those survivor condos before. When humanity eventually destroys itself, he's making a small haven for people who decide to escape and follow him. He's also been experimenting on humans to make these big hulking deformed monsters to fight off anyone who doesn't agree with him. I think its pretty safe to say Spider-Man, Silver Sable and the Paladin all fit under that category for "People who don't agree with Drake". And he thinks so as well, as the experiments attack our heroes! They don't feel pain, as their genetic code has all been reworked, and they only respond to Drake, so the attack is non stop. Spidey and Paladin get separated, each being able to take down an experiment in their own way. Sable goes off on her own way as well, except instead of fighting giant mutated men, she finds where Drake and Chakane are hiding out. She hits them with a needle filled with what must be some kind of truth serum while Spidey and Paladin team up to take down the final mutant. Finally catching up to her, Sable's got some answers from her disoriented prisoners, something that Spider-Man doesn't agree with one bit. On her plane back on the way to Manhattan, she breaks down what she found out and tells her partners that she's going home to Symkaria to do more investigating. She's gonna need some help and asks around, Paladin has another contract that he needs to fulfill and Spider-Man is a little hesitant at first, until she offers to pay one grand a day. Yeah, that's all the convincing he needs, count him in! He figures getting paid to help a good cause, AND possibly keep an eye on Sable so she doesn't resort to her questionable methods again...yeah he's just trying to justify a grand a day. Looks like next issue is gonna take place over seas, get ready for a thrill ride! Until next week!